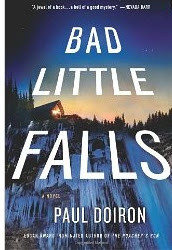 Nearly two-thirds of the way through Paul Doiron’s Bad Little Falls nothing intensely suspenseful has happened. There are a few potential murders lurking in the shadows, and someone is playing nasty pranks on Game Warden Mike Bowditch, but there is still such murkiness to this whodunit or who’s doin’ it that I’m only vaguely lured into turning pages in order to find out. Still, I avidly read to the end. Suspense isn’t what drives me; the developing complexities of Bowditch’s character, his romance and the intensity and precision of Doiron’s writing are. It’s interesting to see 27-year-old warden Bowditch wrestle with himself, to watch him grow. And what a sense of place! He gives such rich and realistic descriptions of the great state of Maine in both its natural grandeur and the sad rough raggedness of its poorest people. Only a narrator who passionately loves the state could tell such a story; only a writer who knows it intimately -- in summer and in winter, in its wealth and in its poverty, on the coast and in the woods -- could create such a narrator. As a native, year-round resident, registered game warden and current editor of Downeast magazine, “the magazine of Maine,” Doiron is such a writer. Character development and setting are the strengths in Bad Little Falls, the third of the Bowditch series. This novel’s plot has the feel of transition. It reminds me of a friend who once described her romantic interest following a divorce as transition man number one, meaning she needed a good but not passionate relationship as she cautiously re-entered the dating world. Following the traumatic professional, personal and romantic events of Poacher’s Son and Trespasser this book offers that same tentative lower key -- a necessary retooling before the next passionate leap. Game Warden Mike Bowditch is busy searching for ties in new territory – he’s been reassigned, you might say banished, to the barrens of the Maine’s easternmost county. It’s a lonely God-forsaken, drug-riddled place where the natives treat him like a leper. Uprooted, Bowditch goes through motions he did in earlier episodes. Scenes feel simultaneously familiar and unsettling. A dinner invitation at the home of a local vet doc has a smidgen of deja vu and promise of friendship and great dinners that father figure retired warden Charley Stevens and his wife Ora offered. But here alcohol seems to be the main course for the host. Bowditch scouts for breakfast and women at the local MacDonald’s – the center of civilization in Washington County, and he imagines his former great love Sarah in her new life with new men in Washington D.C. He flirts with Jamie, local beauty and MacDonald’s employee of the month. His old supervisor Sgt. Kathy Frost, the person he calls the closest thing to a friend he has, is replaced by his new not-so- friendly Sgt. Rivard, a surly supervisor who is wary of Bowditch given his past reputation. This boss seems to be bent on making his new warden’s life difficult. Getting through the Maine woods, back roads and wilderness continues to create scenes. A car slides off the road in this book just as one slid into deer in the last. Snowmobiles join ATV’s as preferred alternative transportation by locals. Newly added to the series is dog sledding. Charley Stevens’ daughter takes to the air in a small plane as her father did before her in Poacher’s Son. <!--[if !supportLists]-->· <!--[endif]-->A weird little boy writes in his journal promising to get vengeance on his mother’s ex-boyfriend. <!--[if !supportLists]-->· <!--[endif]-->Bowditch breakfasts at McDonalds where the aforementioned Jamie catches his eye and two shady looking dirt bags engage her attention. <!--[if !supportLists]-->· <!--[endif]-->Bowditch accompanies his boss, Sgt. Rivard, to a high school to interrogate a teenager who has been snowmobiling in an area where there have been break-ins. <!--[if !supportLists]-->· <!--[endif]-->Someone nails a coyote skin to Bowditch’s door with a welcome warning note signed George Magoon, the name of a fictional jokester. <!--[if !supportLists]-->· <!--[endif]-->During a blizzard Bowditch goes to dinner at the Vet’s house and meets ultra woodsy woodsman, Kevin Kendrick. <!--[if !supportLists]-->· <!--[endif]--> The Vet Doc and Bowditch get called to a nearby home to treat a highly frostbitten, hypothermic man who has staggered to the home after driving off a road. Bowditch goes out into the storm searching for another man who was in the car. These threads weave into a solve-the-murder and find-the-prankster plot. But it’s hard to get worked up over the deaths. One of the potential murder victims is the least sympathetic character in the book, a drug dealer who likely sold a killer dose to another victim, a victim we care or know little about except that she was “a good girl from a good family” and the intravenous drug use was likely a first- time experiment. More central for me is the romance with Jamie. She’s the character I care about. She’s the one who struggles most while disasters just keep piling on. A recovering alcoholic, she’s single mother to an odd child and caregiver to her crippled sister. Her parents have died in an accident. Now, her brother, an alcoholic, but good guy, is maimed and in danger. She has overcome so much, including her own bad habits, and she’s doing so well. Why wouldn’t the warden fall for her? Bowditch has additional reasons for finding her attractive. His family shares traits with hers, and he too, struggles with and recognizes his own “reckless and self-destructive impulses.” Such impulses are the focus of several of those good people with bad habits in the novel – and its setting, Washington County. Finally, the narrator’s knowledge and descriptions of Maine bring so much pleasure. References to Maine’s unorganized townships – regions so unpopulated they’re identified by numbers rather than names; to navigational tools such as DeLorme’s GPS system and the Maine Atlas; descriptions of iced over rivers, peat bogs and blueberry fields covered in snow, all present a recognizable regional portrait. Bowditch shares his knowledge of frost bite and hypothermia, the behavior of lost persons, how to conduct a search, how to remove a skunk, the dangers of driving or walking on frozen rivers and how drowned bodies decompose and resurface. The writer Doiron has immersed himself in warden’s work and its history in Maine including citing the Down East Game War of the 1880s. Nevertheless, the role of warden as detective may be limiting – particularly when it comes to murders, a matter not usually part of the job description. We’ll see how Doiron continues to negotiate this difficulty. His writing remains beautiful. For example, when Doiron debunks the myth that the Inuit have umpteen different words for snow, he says, “They just combine their terms in certain ways to add specificity to their meteorological conditions. Such beauty. Such danger. Such snow. It makes me (almost) want to give in to my impulses and travel back to Maine in winter to watch the woods fill up with the stuff.